the boat, called a keel, that does the work of keeping the boat upright. The various courses are taught aboard boats that range in size from 22 to 40 feet in length. All boats are safe, comfortable and a pleasure to sail. Each course has a maximum of four students. This gives each participant plenty of time in each position on the boat. out what sailing is all about. often the first course people take if they have never sailed before. Youth Keelboat Programs: Designed for youth (aged 13 – 18 as of December 1/2015) who will be working toward achieving their Junior Crew (Beginner level) or Junior Skipper (Intermediate level) certification depending on age and sailing experience. Sailors will be taught aboard our 22′-24′ keelboats in a fun, safe and hands-on environment. Mileage Builder: Our Mileage Builder trips allow you to gain valuable experience while enjoying a cruising vacation. You will be exposed to day and night sailing, furthering your seamanship skills in preparation for handling of a larger cruising boat. Intermediate Cruising: Recommended for people who are interested in owning or chartering a boat. It places emphasis on practical training while living aboard. Advanced Cruising: A challenging course. Objectives are to act safely as skipper and crew of a sailing cruiser of 10 – 15 meters, any modern rig and inboard engine, operating within 100 miles of shore by day and night in coastal or inland water in any weather. Instructor Training: Have you ever thought about being able to share the joy and beauty of our sport? Do you enjoy teaching others? 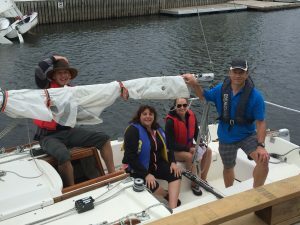 Consider becoming a Sail Canada cruising instructor. We are always looking for enthusiastic instructors who are eager to share their passion of sailing with others!